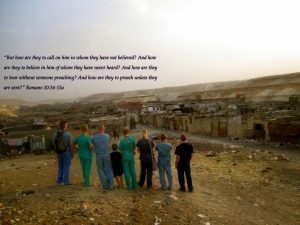 Looking over the vast wasteland of homes, we were reminded that we were there for a purpose. It was more than just medical care we offered. It was more than immunizations and teaching them how to suture their own wounds in the field. It was even more than just telling them we cared–It was showing we cared by being there. Every child had typhoid and parasites, every adult suffered from fevers and wounds they weren’t prepared to treat. The line that extended out the door way of the shanty we used as a clinic was overwhelming. We knew we wouldn’t be able to see them all in one day. We would come back, but even that wouldn’t be enough. We had several nurses teaching the inhabitants of this village how to suture, so I took one of the nurses and a translator to the man’s house to see him. As I walked past the twisted metal doors and cardboard covering the roof, sand sifted in from every crack in the walls, and there were many. We walked through several rooms until we came to his. There was an old mattress on the floor on which he had been sleeping, but he sat up the moment I entered the room. It was a simple request, but being around death and people who are near death’s door, I smelled the odor before we even entered the room. I undressed his wound to find a badly infected foot and gangrene. When I informed the man that it was going to require a hospital and that I didn’t have the means of treating him there, he surprised me. “I don’t want you to treat me with medicine. I know this is far beyond that.” He spoke through our translator. Then he said something to her that caused her to hesitate. I questioned her about what the man had said. I prayed for the many with the tiniest amount of faith. As I left that little hut, all they could do was thank me for coming and praying. It meant the world to them. All I could think about was how horrible the infection was and that it would take a true miracle–an act of God to make this man well. I wouldn’t find out until the next trip that within a week he was walking, and within two he was working again. His foot and ankle healed so rapidly they would stare at it at night praising God for his healing. I don’t apologize for God any more. I pray, and let Him do what He will.